Thanks to CLUTCH22 for sending a little email my way to remind me that its WORLD AIDS DAY. In the craziness that is life its easy to get a little lost in your own world. Its the first day of December and I always think of December as the Ultimate month of giving. What better way to give than in the Product Red Way. Starbucks does more than just sell coffee. 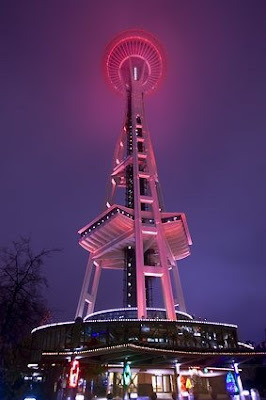 Starbucks got Seattle into the act by arranging the red lighting our beloved Needle. Last month, Starbucks announced its partnership with (RED), a private organization that benefits health programs in Africa through the Global Fund.Starbucks is not paying for the color change. The Space Needle managers agreed to go along because they believe in the cause, said Ron Sevart, chief executive of Space Needle LLC. "You can't buy lighting the Needle," Sevart said. "We would never do that for anybody. But when a charity makes sense, when it's the right kind of message -- this is just one of those causes and one of those partners that it was an easy yes for us." POLYVORE is also getting into the act by holding a Product Red contest. To enter or to just have a little fun while supporting a cause click here. William Sled aka Youtube's "Ask A Gay Guy" does an ambush makeover the Product Red Way. I agree.. go (RED). I am currently writing a ten page ( I know, ten page) report on AIDS. It is an eye opener! Have a great giving x-mas! Great post! Did you finally see the Needle lit up? Thanks for mentioning Polyvore, you chose a great set to feature! Alix - I manage the (RED) Blog, I'd love to post your space needle photo. Can I? 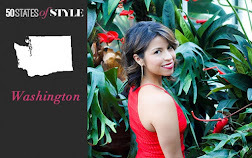 Thanks so much for so much love for (RED) on your blog! Email me at productredblogoutreach[at]gmail.com - thank you!